As you might have heard, the French economy is not in its best shape. As a matter of fact, it is showing signs of contraction. According to the most recent flash Purchasing Managers' Index report, or PMI, released by Markit, France is showing weaknesses in the both the manufacturing and the services sectors. The composite PMI for the country fell to 48 from 49.3 in May. Unfortunately, a figure below 50 means contraction. In addition, the report shows that output in the country is down for the second successive month, orders are falling slightly, and staffing levels suffered their sharpest cut in four months -- not so encouraging. However, two French ADRs are enjoying a strong momentum. One is Criteo (NASDAQ:CRTO), a technology company specialized in digital performance advertising. Let's check them out! The first quarter of 2014 saw record figures for Criteo. Revenue increased 60.8% year over year to $207.5 million, and the company's total number of clients grew 46% year over year to 5,567. Now Criteo holds new and promising accounts with a high amount of traffic, such as Visa and Rent.com. After three years of development, Criteo just rolled out significant technical enhancements to its proprietary prediction and recommendation engine. Basically, this new technology enables Criteo to decide whether to buy each ad impression based on the probability that a user will both click on the ad and make a purchase on the advertiser's site. Now clients will be able to expand their reach to a greater number of potential buyers without paying more per sale. In fact, this breakthrough has brought a 38% sales increase while maintaining the same cost per of sale. Technically speaking, predicting whether an ad impression will generate a click and a sale is not an easy task, as that happens about once out of every 10,000 impressions. But this new improvement will not only improve the accuracy of Criteo's predictions but also help customers maximize the reach and effectiveness of their marketing campaigns. Criteo's global reach is second only to Google Display Network's. According to comScore, Criteo is reaching nearly 1 billion unique Internet users per month. The company manages to reach a large and growing group of Internet users whom other major marketing channels don't. In fact, nearly 50% of Internet users worldwide who saw a Criteo ad were not exposed to Google search ads. Criteo's new engine improvement is set to greatly expand the company's business. It brings pure benefits at the same cost for clients, so it should attract more new clients to the company. If Criteo is not enough, there's another French company positioned to grow: Veolia Environnement SA (NASDAQOTH:VEOEY), which is the world's largest environmental-management services company, having a presence in 48 countries. The strong business case for Veolia is pure demographics. The world will need more clean water in the future -- there's no way around it. In fact, according to the World Health Organization, demand is expected to exceed supply by 40% by 2030. Most of it is related to the lack of access to freshwater sources and irrigation mechanisms. Government and NGO investments to revert this situation are likely to push demand for Veolia's services going forward. Veolia already provides about 100 million people with drinking water and brings sanitation solutions to 71 million people while also managing 60 million metric tons of waste every year. The company's extensive knowledge and international presence should help it get more service contracts going forward; the growing demand is out there already. Almost half of Veolia's total turnover of $30.4 billion is generated outside France. Plus, these types of contracts last at least a few years and hold a high chance of being renewed. Price-wise, Veolia's stock has soared 60% over the past year, yet it's not even close to its all-time high. 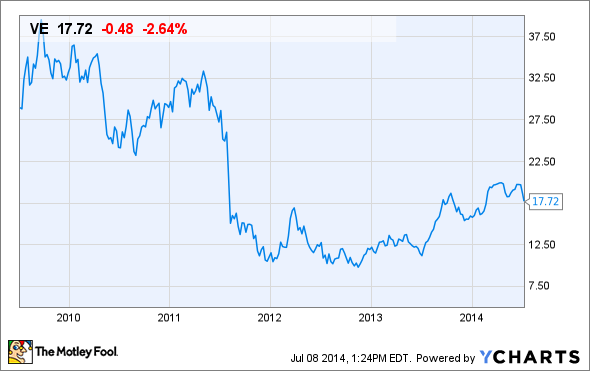 Currently, Veolia is priced at around $18, but in late 2010 it reached prices near $40. Veolia is a solid and stable business to bet on for the long-term. The company's competitive position and the growing demand for clean water are on our side. France is giving us a few signs that the country's economy is losing dynamism. However, these two French ADRs look promising going forward. Both are well-positioned within their markets, and their businesses are not significantly exposed to France.